A Letter to my Assemblyman | Scanned Retina – A Resource for the People! ← Just the Facts…Just the Facts! An e-mail directed to my California Assemblyman, Alan Mansoor’s field representative. Many hours ago I started composing this message. During this process, I was also reviewing my e-mails as they arrived. It is hard to describe what next occurred but this message pretty much summarizes just some of my e-mail activity today. This message is long and detailed. However, each piece of information would seem to be of such critically important nature, I could not bring myself to leave any of it out. Please accept my apologies for my efforts over the last 12 hours. I trust you find find the patience required to absorb this information worthwhile. This just in…more details towards the end of this e-mail. This recorded broadcast that follows crossed my desk today and I immediate thought of Alan and you. The recording was sent to me from Representative Laurie Pettingill of New Hampshire. If you are able to take the time, listening will provide a very comprehensive message as to what we as Americans are facing under this current administration. This information should bear much more significant political weight considering it comes from one more direct representative of the people. Don’t your agree David? When Alan asked what he could do to help…as I had explained, he could simply stand up for America as representative Harry Accornero and the others in New Hampshire have done. You will find references here, here, and, here. Another update in from Representative Accornero several hours ago. Now you may find this next link to be a fascinating find. Very revealing. By now, David, perhaps Alan has had time to think about this? With Sheriff Joe’s investigation, periodically turning up new information time is running out to be on the side that counts. The next press release is on MARCH 31st. In case you had any doubts with regard to how we have found ourselves in this position, the following document in PDF format, describes some of the most accurate details of the history about which I have become aware. If indeed Alan and you are truly sincere in your desire to do the right thing for America, as you both expressed in our meeting on Friday, March 16, 2012, and specifically for the people in your district and California as well, then I will expect to hear from you very soon as to how we can begin to act in concert to move forward on plans to expose those who are behind this sedition and to begin actions to stop the implementation of Agenda 21 in its tracks. While Alan considers the decision to join other patriotic legislators and ask Congress to charge Obama with treason, all of our state legislators, who by Constitutional law must protect their state citizens from this gross abuse of the federal government, must also contemplate how they will deal with the obviously criminal complicity of the free press. 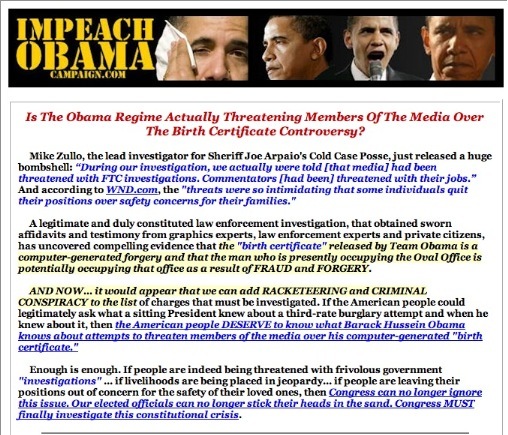 Obama reportedly resorts to threatening law enforcement agencies? Media members? The murder of Breitbart? How can this be? Yes…the free press, also known as the mainstream media, of course you all well know the major media outlets owned and controlled by about 6 major companies ( http://tinyurl.com/6r7molv) and all dedicated to the same agenda of the New World Order. A “free press” who are willingly adding to the complicity of the Congress in suppressing the truth. And below link as well. And who could dispute the facts…. You know David….you just can’t make this stuff up! One more blockbuster for this message. And here is exactly how all of this comes to personally roost at each of our respective doorsteps. So how are your loved ones holding up? One more reason to charge this impostor with treason, try him and if found guilty…Hang him! Thank you for your time on this David. I look forward to hearing from you shortly.